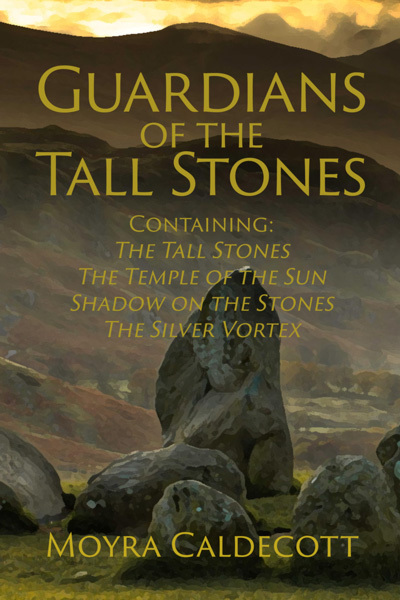 Guardians of the Tall Stones by Moyra Caldecott, is now available exclusively for the Kindle from Amazon. You can also read it for free with Kindle Unlimited and the Kindle Owners’ Lending Library. An ancient community is threatened by the evil designs of a corrupt and ambitious priest, and its only defence is the courageous young psychic Kyra. The Guardians of the Tall Stones is set in Bronze Age Britain, a time when magic existed in the workings of everyday life and the threat of evil loomed in the shadows. This book contains four novels. For more info, please see the Guardians of the Tall Stones page on mushroom-ebooks.com.